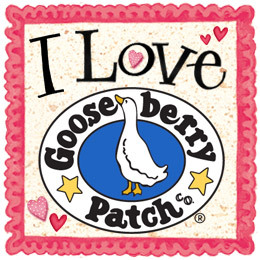 I love finding ways to infuse a little heart fun into the days preceding Valentine’s Day. 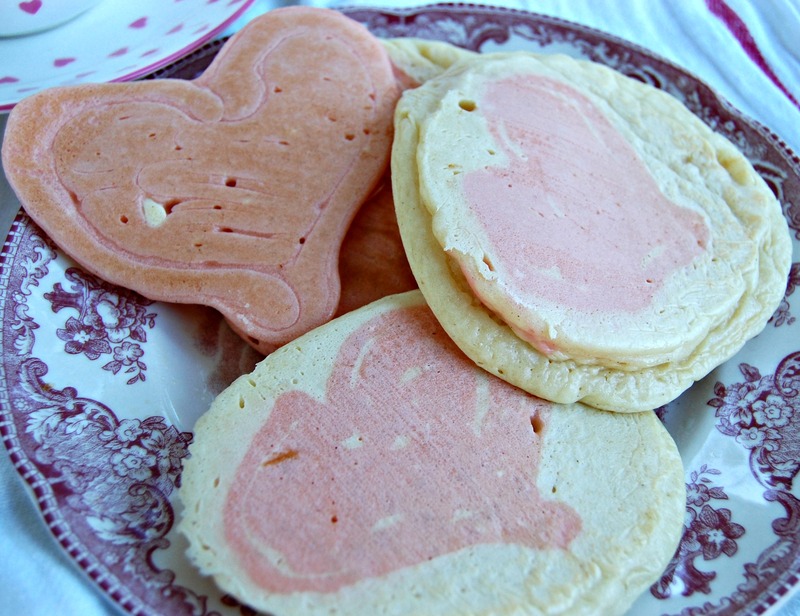 Therefore, the sweet heart is a leading character in our home and often takes the form of food like these heart pancakes. 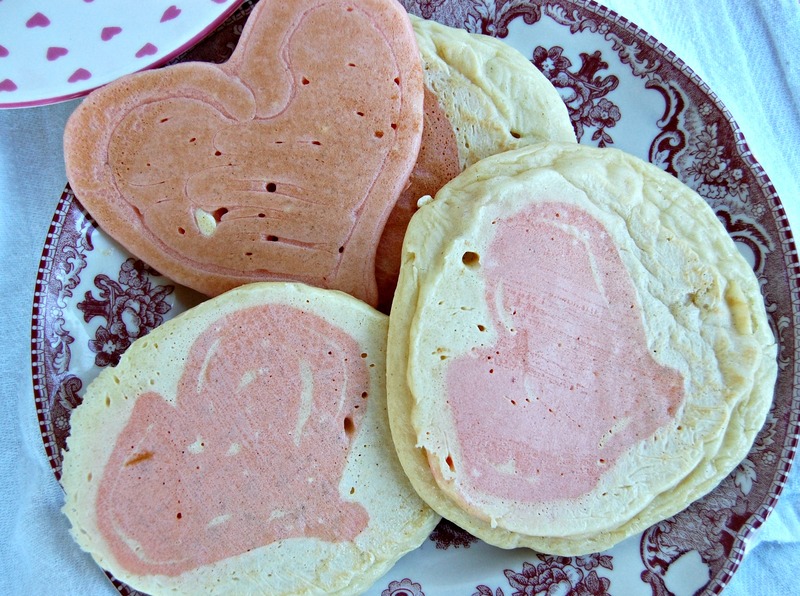 Although I have a heart pancake mold, my little girl likes these “pink on white” pancake hearts. Make your favorite pancake batter. Remove a bit of the batter and place it in a small bowl. Add as many drops of red food coloring to achieve your desired color and stir (I use 3 drops). Pour the colored batter into a squeeze bottle (I use my icing squeeze bottle). Begin cooking pancakes as you normally would using the “white” batter. Let pancakes cook for about 30 seconds and then squirt heart shapes on the pancakes using squeeze bottle. Continue cooking as you normally would. I’m not sure what my little one loves more. Hot cocoa or the marshmallows that adorn it. I can’t bring myself to limit her marshmallow madness when we have hot cocoa. Simple childhood pleasures. 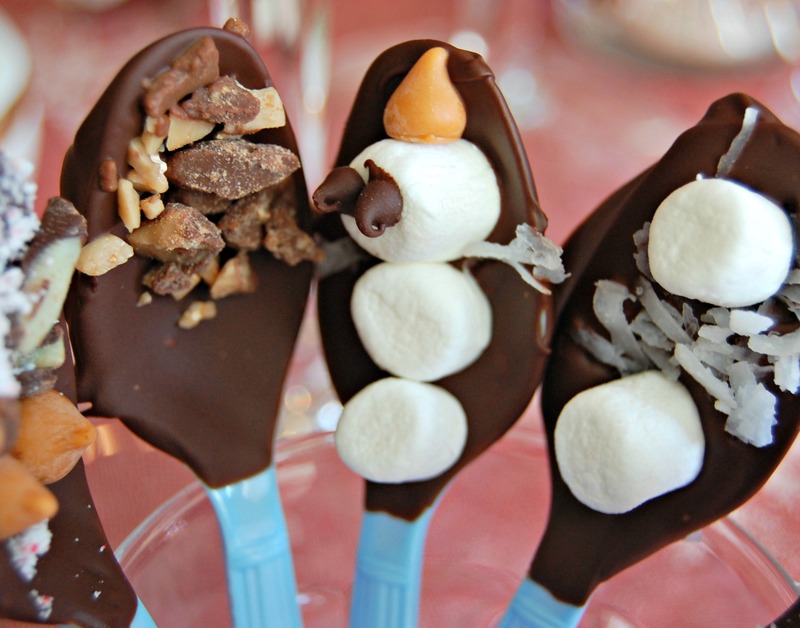 The other day Munchie and I made hot cocoa stirrers for our hot cocoa. You know, because I might as well push the sugar thing to the max since I’m on a roll. 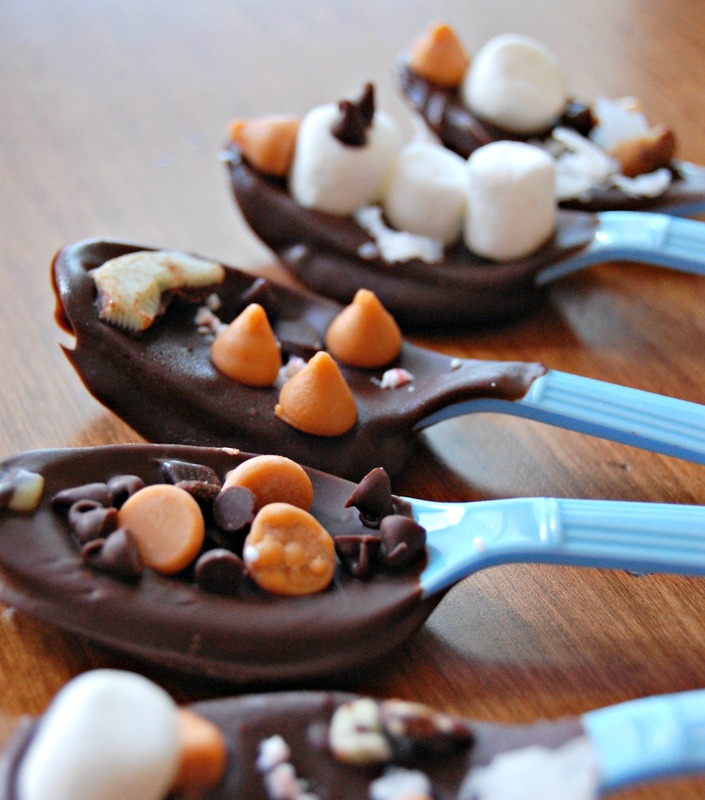 My girl was over-the-moon excited to decorate her chocolate-dipped spoons. 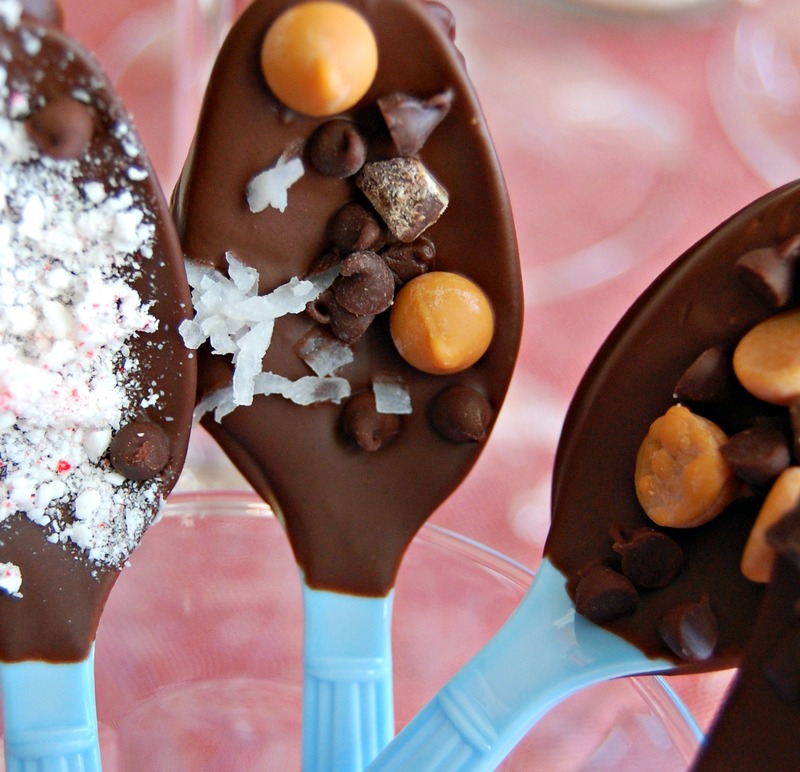 You can use whatever type of chocolate chip you like. We used semi-sweet chocolate chips, but butterscotch and peanut butter chips are fun, too. Place about 1/2 a cup of chips in a microwave-safe bowl and heat in the microwave in 20-30 second intervals, mixing between intervals, until chips melt completely. 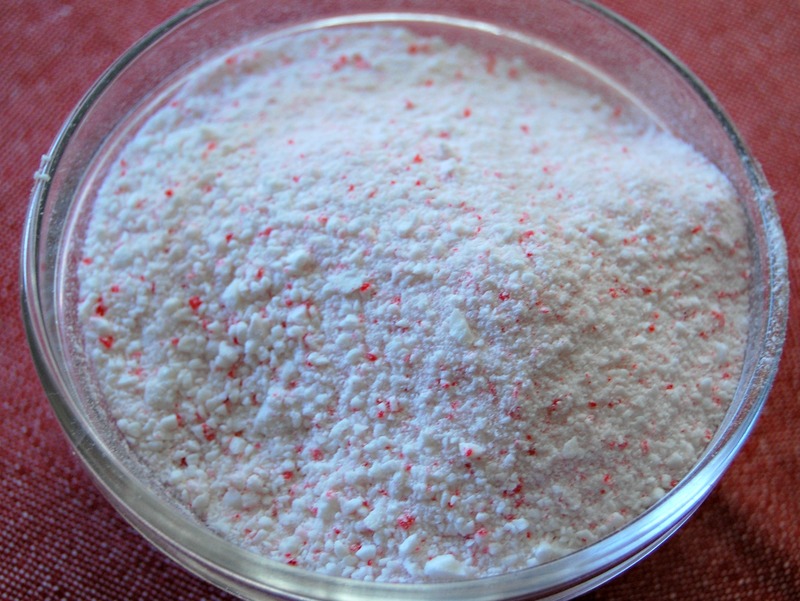 My favorite is the Peppermint Snow which is simply candy canes (or hard peppermint candies) whiiiizzed up in a food processor. I used my mini food processor which was the perfect size. Plus, I didn’t have to drag out and wash my regular size food processor (lazy). 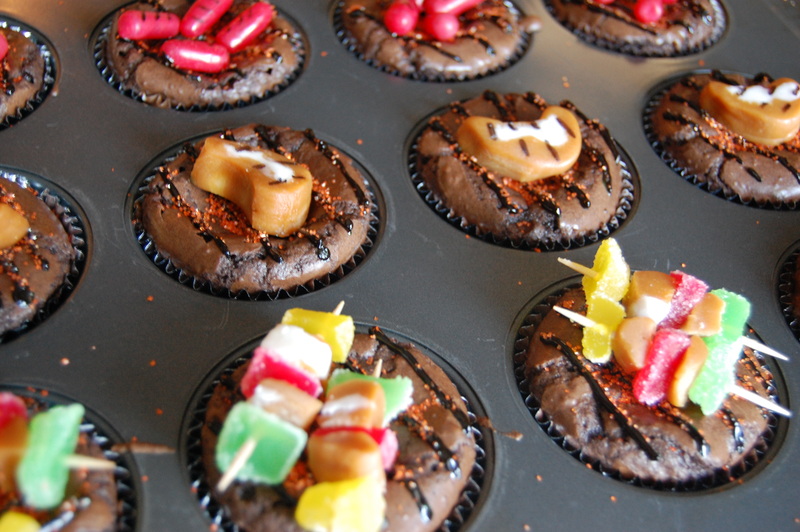 Let your decorated stirrers cool/harden completely before using. My little one wanted to use one in her cocoa immediately so I placed them in the freezer for about 10 minutes to speed up the process . 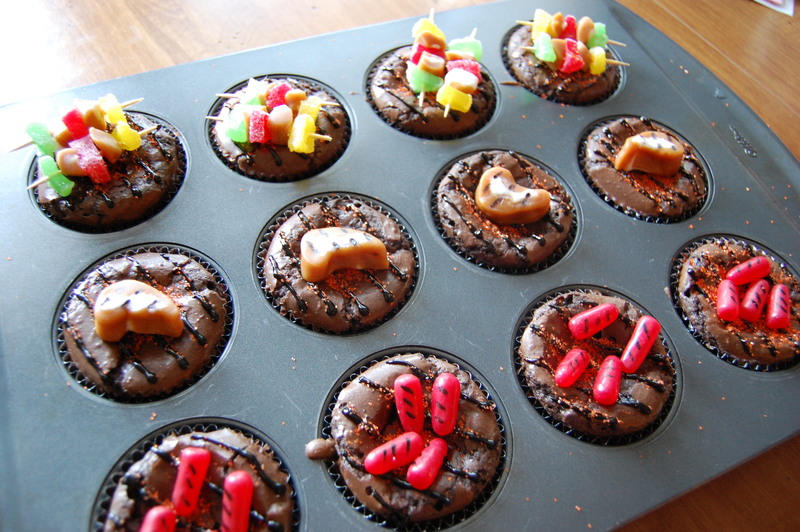 These also make great little gifts–just be sure to let them cool/harden completely before wrapping. 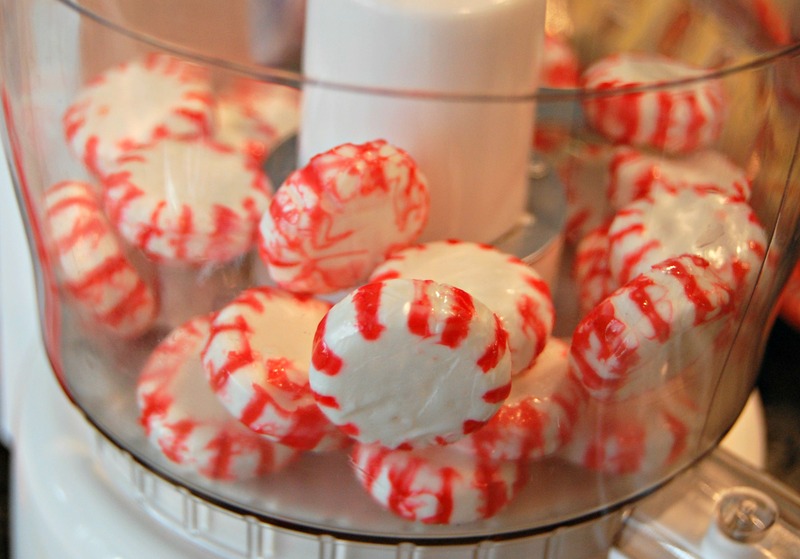 I use small cake pop/lollipop clear baggies & tie with a piece of ribbon. Munchie made a snowman. Cutie pie. Looking for a hot cocoa recipe so you can start stirring asap? You can check out my Creamy Dreamy Hot Cocoa recipe here. Welcome to A Cozycakes Christmas: My Organized Christmas Series! *We’ve hit the enjoying and maintaining portion of the series which means that all of our biggest preparation & cleaning tasks are complete. We made it! I hope you’ve had time to relax this past week, taking time to celebrate the season. Task 1: Continue shopping for/creating gifts: I know you’re working on this area, but I included it as a reminder. Don’t forget to check deals online, store circulars, etc. Also, if you’re creating/making any gifts, be sure to check for coupons for craft and grocery stores. There are great deals to be had if you do a little research before heading out. Task 2: Maintenance: A reminder to do your daily 15 minute maintenance. You can read about it here. Basically, set the timer for 15 minutes at the end of the day/night, enlist family helpers if possible, and tidy up the home before bedtime. Dishes, wipe down counters, pick up toys, etc. We’ve done so much organizing and cleaning–keep up the simple maintenance of your home so you don’t reverse all that hard work! Do this even on weekends. For the next few weeks leading up to Christmas, I’ll be posting about my Christmas organization which will include ideas, tips, printable lists and more. You can read more about the series in detail here. I want to thoroughly enjoy my favorite time of year and that means eliminating as much of the planning, hosting, & celebrating stress as possible. *It’s Day 13 of the series and we’re almost done! Just a few more things to cross off our lists and then it’s time to relax and enjoy the rest of December. Task 1: Guest Room & Office Space: Guest Room: If you plan on having overnight guests this month, it’s a good idea to get your “guest” space ready. You might not have a guest room, but you can still alter this task to prepare whatever space you use for guests. I’ll write the task as if it’s a bedroom: Set the timer for 20 minutes and declutter the space. Put items in their homes. Wash/change sheets, fluff bedding. Put an extra blanket out for cold nights. Dust and wipe down furniture, mirrors, and windows. Add a few extra hangers to a closet–your guests will appreciate even a very small space in a closet to hang a few items. Vacuum/mop. Have light reading (magazines, novels, cookbooks 🙂 available on a nightstand or small table. You can add other welcoming touches just before guests arrive like water, flowers, and snacks. Office Space/Room: Set the timer for 15 minutes and do a quick declutter and clean up of your office/office space. File papers, put stray items away, dust and wipe down surfaces. Toss/recycle/shred papers no longer needed. Disinfect/wipe down computer. Straighten bookshelves and drawers. Vacuum/mop. Task 2: Continue shopping for/creating gifts: I know you’re working on this area, but I included it as a reminder. Don’t forget to check deals online, store circulars, etc. Also, if you’re creating/making any gifts, be sure to check for coupons for craft and grocery stores. There are great deals to be had if you do a little research before heading out. Task 3: Maintenance: A reminder to do your daily 15 minute maintenance. You can read about it here. Basically, set the timer for 15 minutes at the end of the day/night, enlist family helpers if possible, and tidy up the home before bedtime. Dishes, wipe down counters, pick up toys, etc. We’ve done so much organizing and cleaning–keep up the simple maintenance of your home so you don’t reverse all that hard work! Do this even on weekends. *It’s Day 12 of the series and since it’s Friday, I won’t post tasks on Saturday & Sunday. However, since today’s task covers all bathrooms in your home, you might need to spend a few minutes on it over the weekend as well. If you only have 1 bathroom, you’re golden. 🙂 And we’re off! Task 1: Clean and declutter bathrooms: You can choose how you want to handle this task if you have more than one bathroom. Maybe you want to declutter each bathroom and then tackle cleaning all of them. Maybe you’d rather complete one whole bathroom before moving on to the next. Your call. I’ll write the task for one bathroom and you go from there: Begin with your medicine cabinet. Toss expired products. Wipe down shelves and organize cabinet. Take note of any winter items you might need such as cough medicine. Empty bathroom drawers and cupboards, tossing expired and broken items, donating extras or unused items. Wipe out drawers and cupboards before refilling them. Clear counters of clutter and place items in their homes. Leave out only what is necessary. Check the shower and bathtub for grimy toys that should be tossed or washed. Toss any trash like dull razors and empty shampoo bottles. Toss/share/remove magazines or books you’ve read. Next, deep clean the bathroom. Scrub the inside and outside of the toilet, clean windows and glass, clean shower, tub, sink, and counters. Wipe down the outside of cupboards and baseboards. Vacuum/mop floor. Dust/clean fixtures. Empty trash. Whew–finished! *It’s Day 11 of the series and take a look back: We are doing small tasks each day, but making great strides! It’s almost time for us to sit back and enjoy Christmas without an abundance of stress and chaos. Even if you feel behind on the tasks, don’t worry! Complete them when you can, friends. All your efforts count toward a more peaceful and enjoyable season. Task 2: Maintenance: We’ve been cleaning, purging, and organizing, but how about making sure it’s not all for naught? Today we begin our maintenance. We’ll take 15 minutes each evening (or when it suits you best–I prefer evenings) to tidy up our homes. Put dishes in the dishwasher, clear off and wipe down kitchen counters. Pick up your living areas (I suggest using a basket to transport items to their homes): fluff pillows, fold throws/blankets, put toys away. Windex bathroom mirrors and wipe down bathroom counters. Empty trash from rooms if needed. Walk through bedrooms & other rooms, gathering dirty laundry and cleaning up stray papers, toys, etc. Enlist your family and have them work on an area so you’re not the lone Maintainer :). This 15 minutes may sound like a lot of work, but it’s really nothing. Chances are you’re already doing this in your home. The quick tidying makes a world of difference for me. I love coming downstairs in the morning to an organized and clean space. Task 1: Declutter and organize your closet: Okay, you did the other closets in the home and we can’t ignore your (my) closet. Yes, this challenge is really for me. My closet has been a thorn in my side for a long time. No matter how much time I put into it, I keep things that no longer fit, store things there that have nothing to do with clothing, and let it become a mess more often than I like to admit. Time to do a little pre-holiday closet organization. Set the timer for 20 minutes and hang clean clothes, pick up anything on the floor and place it in its home, rearrange clothes for the winter (pack away clothing if that’s what you usually do), and straighten up. Clean mirrors, organize shoes, toss broken hangers and donate clothes that no longer fit you. Also, take this time to plan any holiday event outfits you’re going to need in the next few weeks. Be sure you have everything you need to pull together said outfits–no rushing out at the last minute to find the perfect silver heels. 🙂 You’re done! Task 2: Plan holiday baking: If baking plays a large role in the season for you, then it’s time to make your baking plan. Print out the Baking Planner worksheet and take out your Gift List Planner. 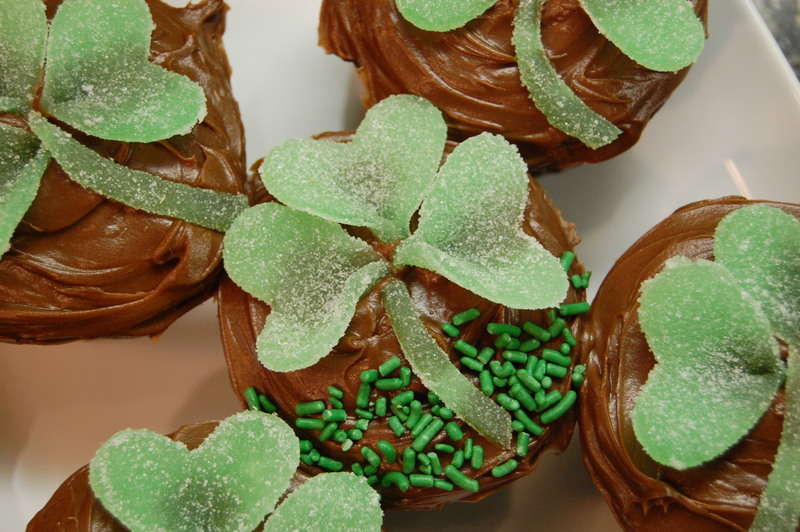 You likely want to bake for yourself/your household in addition to baking for others. Fill out the Baking Planner noting important ingredients you will need. Decide how you will spread out your baking (will you bake all at once or spread it out over the month, gifting at different times?) and fill in your “baking day/s” on your Christmas Calendar. Next, gather all recipes needed and keep them in an easily accessible place. Then take inventory of ingredients and supplies on hand and add items needed to your grocery/store list. Some ingredients may be on sale so it might be helpful to purchase all or most items at once to save time and money. Try to limit your number of trips to the store–We’re trying to simplify and relax this season. 🙂 You’re set for your holiday baking! *It’s Day 9 of the series and we’ve already accomplished so much. I’m feeling pretty darn good about my progress. What about you? It’s a busy week in the series, but by next week I believe we’ll feel more relaxed and ready to enjoy the holiday month. Let’s get moving, friends! Task 1: Declutter children’s rooms & toys: This is a bit of a tough area to declutter sometimes. Left to themselves, toys multiply like Gremlins. Start with the clothes. Pack away or donate (you decide) items that no longer fit or are out of season. Tidy up dressers and closet spaces. Toss broken toys/items and trash. Group toy items and encourage little ones to maintain these spaces. Bring in kiddos to assist with donations & purging–empower them with choices about which toys and clothing to give to those with less than them. This is a great opportunity to discuss the abundant blessings in our lives. Wipe down surfaces and dust. Clean windows and mirrors. Vacuum and you’re done! Task 2: Work on Christmas Cards: Grab your filled out Christmas Card List. You should have a mailing date scheduled and noted on your Christmas Calendar. Now, start prepping for your send date. If you have some time before your send date (my send date isn’t until the 2nd week of December), split up the card tasks: take a portion of the envelopes and address them today. You can even do this after dinner while you watch a little t.v. If you’re writing a newsletter, get your letter written. If you need to order your cards/picture cards, work on that. Need to buy stamps? Go ahead and get them now. Schedule your card tasks today and note them on your calendar if you haven’t already. I’ll leave you on your own for the rest of this task since you will now have it scheduled on your calendar. Just be sure to check your calendar daily! *It’s Day 8 of the series! I’m shouting for no other reason than it’s beginning to feel a lot like Christmaaaas (sing it!)! We are finishing up in the kitchen today and working on a printable which I think will help you get in the spirit of the season. Here we go! Task 1: Clean off kitchen counters and dining tables & deep clean the kitchen: Now that the holiday weekend has passed, you probably either have a super clean kitchen & dining area or those areas are in need of clean up. If you’re in the latter group, clear the clutter from the counters and dining tables (dining room and kitchen tables) and put everything in its home. Then wipe down all counters and tables. Dust where needed. Next, “deep clean” your stove/oven and microwave: do whatever “deep clean” is for you. For me, it’s getting to the nitty-gritty and making sure everything is clean as whistle. Wipe down the top of your refrigerator and, if possible, pull out your fridge and vacuum behind/under it. Also, clean any glass or windows in your kitchen. Ah, feels good! Task 2: Cozy Christmas Traditions: Print out the Cozy Christmas Traditions worksheet and write down the traditions you would like to continue or add this year. I left room for 8 traditions, but you can print out multiple copies if needed. I think 8 is a good number because it leaves you time and energy to focus on precisely what’s important to you. Sit down and chat it out with your family. Maybe you would all like a little change this year. Maybe you’d like to simplify your Christmas and seek what’s a priority in your Christmas heart. And remember: these traditions need not be major events. One of our favorite traditions is baking and decorating dozens of sugar cookies. We stay in our jammies all day and are covered in frosting by day’s end, but that’s just how we like it. Finally, be sure to schedule your traditions on your Christmas Calendar. *It’s Day 6 of the series…actually, it’s nearly Day 7, but I’ve had problems with posting today. Therefore, I’m combining Day 6 and Day 7. Then we will break until after the holiday and so I wish you all a Happy Thanksgiving! Task 1: Clean out the refrigerator and freezer: Although you’re probably stuffing your fridge with items for your Thanksgiving feast, it’s time to set your timer for 20 minutes and have a go at your fridge & freezer. If possible, empty your fridge of its contents, toss expired and past-their-prime items, wipe down shelves, and reorganize as you fill it back up again. Do the same for your freezer. I won’t get into how to organize your fridge and best use this space–you can find a myriad of suggestions for that online. I simply categorize my fridge just as I do my cupboards. Condiments in one area, dairy in another, etc. Things I use most often are close to the front, etc. Now you have room for all those delicious leftovers come Thursday. If you have an extra freezer or fridge in your garage or basement, and if you have an extra 20 minutes, go ahead and have a go at those as well. Also, if you have “freezer meals” stashed away, you might think ahead and place those closer to the front of your freezer so you can easily grab them for use in December. You’ll be glad you have that freezer meal when you get home, cold and exhausted after a family outing or a busy day at work. Task 2: Update Christmas card list addresses: You likely did this as you composed your list, but maybe there were a few addresses you couldn’t find, didn’t have nearby, etc. Gather up those little scraps of paper in your office with address changes on them (ahem, that’s a note to me 🙂 ) and update the addresses in your address book. Since you created the Christmas Card List a few days ago on Day 4 and possibly added a few new recipients, you might not have those addresses yet. Time to send an email/text, or make a phone call to get those addresses. Task 3: Begin (or continue) shopping for/creating gifts: I know that some of you are saying, “Ha! I’m already done!” And to you I say, “HURRAY!” Really, I do. What a great feeling it is to be done with your Christmas shopping before December (or Thanksgiving!) arrives. But for those of us who aren’t there yet, now is the time to either begin or really get the ball rolling. Whether or not you take part in the American Black Friday tradition, it’s a good time to grab great deals on items you might have on your list. So take out the Gift List Planner you filled out on Day 3 and review it for anything you might be able to buy this week. 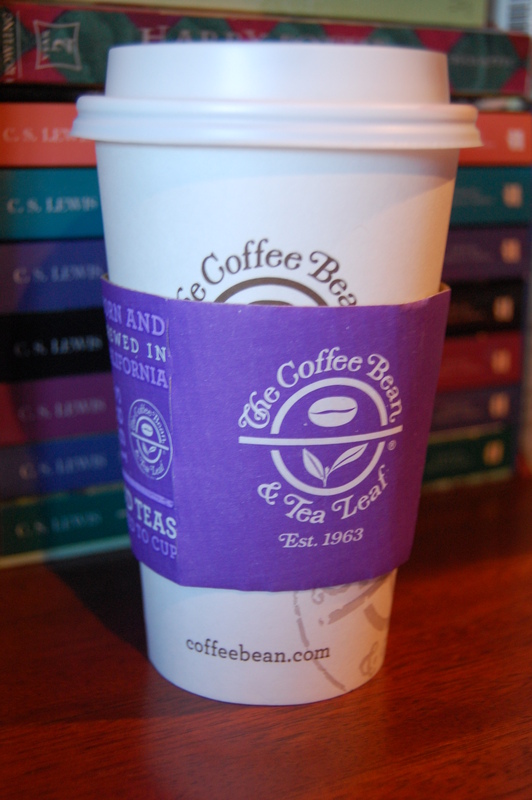 A note: I am not encouraging you to hit the stores at 4 a.m. on Black Friday (but if you do, have fun!). There are other ways to grab real deals (not sneaky deals designed simply to lure you into the store). I do a lot of my shopping online and I ALWAYS check coupon sites for free shipping codes because I generally refuse to pay shipping. Many places already have their Black Friday deals up online and their advertising out. Some sales have already started. For example, I checked out a popular store’s Facebook page last week and found a “20% off entire purchase” coupon which I was able to use on sale items–the awesome part? Most of the store’s clothing was already 40-60% off! Woo! No need to fight major crowds if you plan and shop smart. You thoughtfully created your gift list, right? You’ve simplified your list? You’re giving from your heart not from obligation? Then I’d bet you probably don’t need to rise before the sun on Black Friday and fight crowds because you’re also gifting homemade items, purchasing fewer items than usual, etc. Good for you! You can work on some of those homemade items or schedule them in your calendar. You can also take advantage of sales to purchase those items left on your list. Whatever your “gifts” are, take time to work on them, schedule them, organize them. And when you start to get crabby during a crowded shopping excursion or when you make a mistake while creating something that is to be a gift, take a moment to pause and remember who you’re doing this for, why you’re shopping/creating for them, and what it means to you to give to them. Giving should gladden you, not cause anxiety and stress. Take a breather and start again. *It’s Day 5 of the series and today we’re focusing on clearing more clutter. Making sure my home is in order before December descends on me means that I’m less stressed and more pleasant to be around. 🙂 No joke. When my home is in disarray, I can’t focus on the good things. No one wants to be around that gal. If you’re anything like me, the decluttering cleanses your mind and your soul. Here we go! 1) If you’re behind on the tasks, please don’t stress. This series is meant to be a help not a guilt-inducer. You can jump in at any time and you can also play catch-up wherever you need–we will be taking weekends (and Thanksgiving) off so those days are “extra days” where you can do what you need to. But please don’t work on Thanksgiving! 2) Be sure to keep your printables in a safe place because you’ll need them throughout the series. I keep mine in my homemaking binder so I always know where they are (let’s hope I don’t lose my binder!). Task 1: Declutter kitchen drawers and cupboards: We’re back in the kitchen today. Time to open the cupboards and drawers. Believe me, I know it can be a tough area to tackle, but we’ll feel quite accomplished when we’re done! (suddenly I’m all-knowing. 🙂 ) Set the timer for 30 minutes and go through all your drawers and cupboards, removing any extra items you’ve accumulated: do you need 3 veggie peelers? Probably not. Just because that lizard dish was a gift doesn’t mean you need to hold on to it for eternity. If you don’t love it, don’t use it, don’t need it…Get it out of the house. If you don’t use the coffee carafe from your old broken coffee maker, toss it or donate it. Do a quick wipe down of the drawers and cupboards when they’re empty. Next, organize items like you did with the pantry: keep like items together and, if possible, create zones. For example, it’s much more efficient for me to store oven mitts and hot pads in the drawer directly next to my oven. My spice shelves are divided into zones as well: baking items and baking spices take up one shelf while my oils and herbs live on another shelf. And don’t forget storage containers! Those pesky things seem to multiply and I always find myself with missing lids or I find extra lids with no matching containers. Toss/donate those items without a mate! You might need more than 30 minutes to do this–if you choose to take extra time on this task, wonderful! If not, just focus on what you can accomplish in 30. Any extra work or tinkering you’d like to do in here can be done when you have a few extra moments throughout the next few days. *It’s Day 4 of the series already! And it’s only November 15. I’d say we are doing a mighty fine job, wouldn’t you? A couple of things before we get to the tasks for today. Task 2: Declutter pantry and cookbooks: Don’t worry, friends. We aren’t attacking the entire kitchen today (I wouldn’t do that to ya!). We’re focusing on just your pantry (or the cupboard space/area you keep pantry items) and your cookbooks. Set your timer for 20 minutes and toss expired items, donate items you won’t use (be honest, my friends), and create sections in your pantry. For example, put all flour, sugar, & baking items together. Dust if needed. Grab a pen and paper and take note of items you will be needing for December. Remember to note items you are running low on as well. Next, go through your cookbook collection and donate any that you will not use or have never used. This is a tough task for me because I LOVE cookbooks and have a hard time parting with even the ones I never use. If I can do it, you can do it! Task 1: Print out the Gift List Planner. Then have at it! I’m going to suggest that you take your time and really think through each person on your list. Simplifying your holiday is a great way to make your season brighter. Give gifts because it comes from your heart, not from a sense of obligation. And remember, gifts don’t have to be store-bought to be special. There are probably people on your list who would prefer to receive your famous gingerbread as a gift over a Starbucks gift card or mug (nothing wrong with those gifts 🙂 just providing an example!). Task 2: Declutter coat closet & entryway: I chose to include the coat closet/hall closet and entryway because it’s a season for entertaining and not only will guests and your family see/use both spaces, but it helps set the tone for the rest of your home. Seeing a cluttered entryway every time you walk through the door does not a cozy house make. Set the timer for 20 minutes, grab a basket and clear out items that belong elsewhere (place them in the basket and return them to their homes after you’ve decluttered these spaces), make room for guests’ coats, add a few extra hangers, place shoes on their racks or in baskets, and organize any items you store in the closet. Pack away seasonal items and leave room for winter items such as umbrellas, rain boots, and rain coats. Put away entryway knickknacks to make room for holiday decor. UPDATE: I realize I didn’t include days of the week on the calendar printable. I’ve fixed that and apologize for any inconvenience! *It’s Day 2 of the series and we’ve completed the task for Day 1 which was to print and fill out the All I Want for Christmas: Your Christmas Heart Worksheet (Printable). It’s time to jump in and really get the ball rolling. Don’t let that scare you off–we aren’t doing so much in one day that you’ll be overwhelmed. But we will be checking off some important things this week so that we have more time to celebrate the season later. We will also begin accomplishing at least 1 decluttering/cleaning mission a day. I find that I’m best able to enjoy events, holidays, life 🙂 if my home is in order. I think many people agree so today we will start with one space in the home. Sound good? Let’s get going! Task 1: Print out the Christmas Priorities: Master To-Do List (Printable). Using your Day 1 Christmas Heart Worksheet for assistance, create your master to-do list. Be sure to list your most important Christmas activities, taking care not to over-schedule yourself and your family. Remember: This isn’t about doing ALL you can: It’s about doing what means the most to you and your Christmas heart. Fill in all the things you need to accomplish such as Christmas cards (writing/mailing/ordering), baking, hosting guests, buying gifts, mailing gifts, etc. I encourage you to remember your Christmas Heart and don’t do things just for the sake of doing them. Task 2: Print out the Christmas Calendar. Assign deadlines (days or weeks) for the items on your To-Do list and write them all in the calendar. You can also include holiday parties and other social events to the calendar. Task 3: Declutter Living Room/Family Room: Set the timer for 20 minutes and take a walk through your living/family room. Place stray items in the basket (return them to their rightful spot after you’re done in this room). Place remote controls, magazines, books, toys back in their “home” and take a moment to go through magazines & books to recycle/donate those you’re done with. Pack away, toss, or donate items you no longer love or need such as broken items, knickknacks, old remote controls, etc. Find a quiet spot and reflect on your Christmas heart–what do you hope to achieve this Christmas season? For example, I thought about why I love the Christmas season, the reason I celebrate, and what my favorite elements of the season are. For me, Christmas is a time of giving and thanks, a time to celebrate the birth of Jesus Christ, and a time to share that love with dear friends and family. For example a few items on my list are “showing kindness and blessing others, celebrating Jesus’ birth, gathering with friends and family, and making holiday memories with my daughter.” You can be more detailed with your list, but the main idea is to get your thoughts down on paper so that you can refer to it as we continue the series together. Keep this list in a safe place, be it a holiday binder or taped to your fridge. Until our next task, you can start thinking about the items you listed and get yourself motivated! In my dreams I enjoy each and every day of December until Christmas. From the 1st through the 25th, I’m baking holiday treats for family, friends, and neighbors. 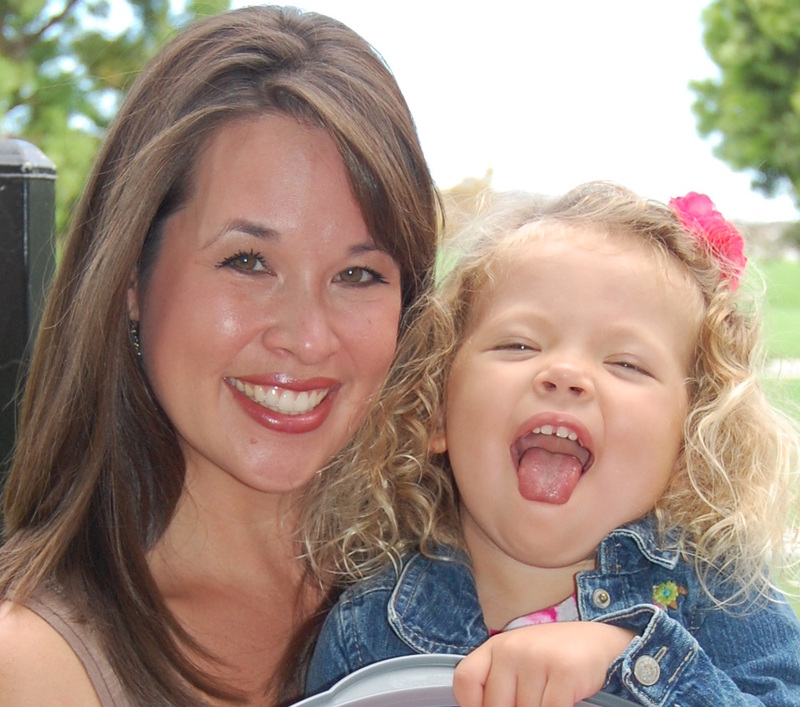 Sharing the Christmas story with my little girl through crafts, books, and the Bible. Creating a winter wonderland in my home with kiddie craft decor, homemade garland, and treasured ornaments and figurines. Hosting Christmas gatherings on a whim because everything is “ready” for last minute guests festivities. Frolicking (I’m a fan of frolicking, it’s cool) to and fro, soaking in the Christmas spirit through music, festivals, church bells, and whimsical store displays. Carving memories and building traditions without the stress of self-induced holiday hustle and bustle. And most importantly, sharing the (pardon the cliche) reason for the season with my family, specifically my little girl. Taking our time to explore the meaning of Christmas without the negative impact of hyper-scheduled lives, growing shopping/gift/to-do lists, and an unorganized home. Some years are better than others, but, for the most part, I need to make concerted efforts to organize and plan the days leading up to my favorite time of year in order for me to make the best of December. And this year I’m determined to add November to the list. 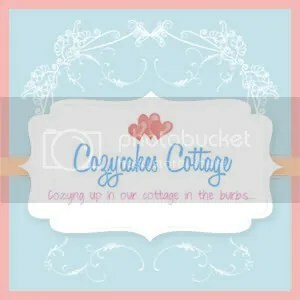 I’m launching A Cozycakes Christmas Series today to get organized in these fast-moving days before Christmas. I’d love you to join in if you, too, find a bit of organization and reflection helps you enjoy the season. I don’t like stressed Danielle. I don’t like over-scheduled Danielle. I don’t like waking up in mid-January with a bit of regret in my belly and a whole lot of longing for what I didn’t accomplish or savor during the holidays. If my home is out of order, my mind is out of order. And that means that the good stuff–the quality time with family and friends, the heartening worship, the QUALITY–drops off my list of important things. A couple of gals on my Cozycakes Cottage Facebook page requested that I share my Christmas/To Do List Christmas TEST. I mentioned I was in the middle of creating my holiday lists and they were eager for me to share what helps me get through the season. If I can help you out a wee bit, then I’m happy to share. I wanted my lists to be as helpful as possible so I’ve been working on them, burning the midnight oil. That’s a lie–I haven’t burned the midnight oil, but I’ve tried to put more time in them than I normally would. Because, let’s be honest, by helping YOU, I’m helping ME. And there you have my reasons for organizing my Christmas in this public forum. Some of you are way ahead of me and already done with Christmas prep. Kudos to you! I envy you and I think you’re awesome. 🙂 But if you need a little help or support, here I am! I’m here to support your Christmas heart. Stick around for the next few weeks and let’s get ready together. I got your back, you got mine. Later today I’ll be posting Day 1 of this series. I’m keeping it as simple and straightforward as I can and I hope you’ll join me! See you soon! I got up too early this morning. This is how I functioned. I loved being the only one in the coffee shop and seeing the sweet elderly group in the mist doing their Tai Chi in the park across from my home. Though I am a nightowl I’m always glad when I do get up before the sun rises. Even if I whine about it at first. Which I do. In case you can’t tell (oh I hope you can! 😦 ), they’re supposed to be food on the grill. Sausages, kabobs, and pork chops. Wishing you all a relaxing and wonderful Father’s Day! 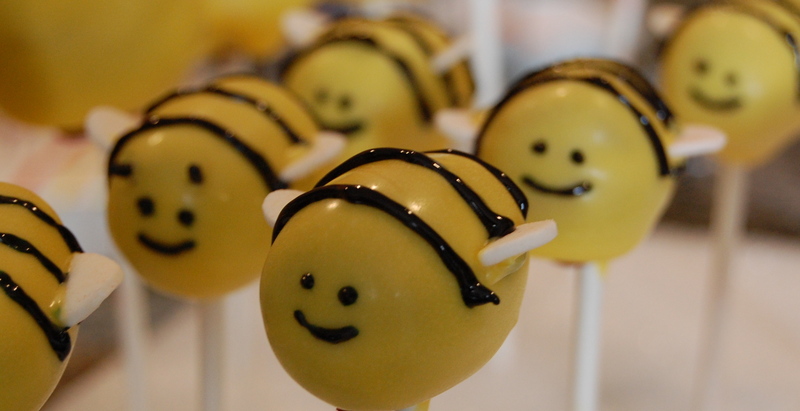 I can’t stop making cake pops. And I don’t wanna. They’re too fun. And after my recent popping session with Sandi, I’m on a cake pop high. 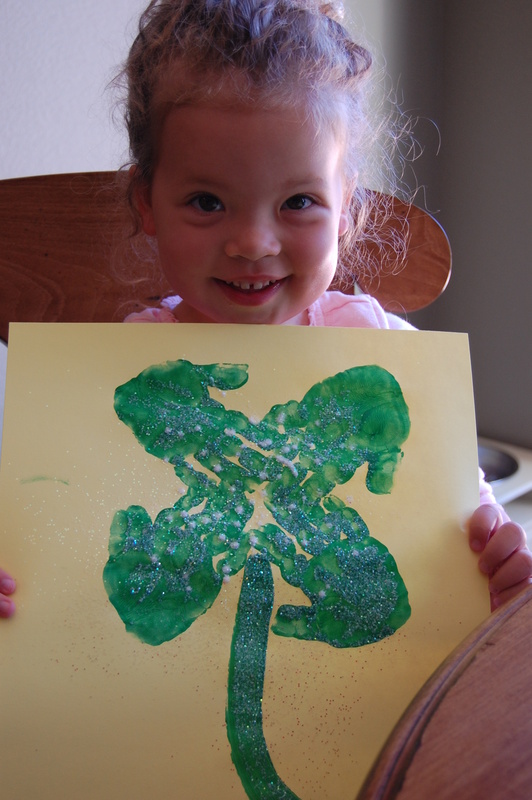 Here’s an easy St. Patrick’s Day art project for those of you with kiddos. All you need is green paint, a large sheet of paper, and a paintbrush. I painted Munchkin’s hand with green paint and then she made the 4 handprints on a piece of yellow construction paper. I’m kind of glad we were out of white because the yellow is fun for the holiday (although the lighting in these pictures is off). Then Munchkin painted a stem. 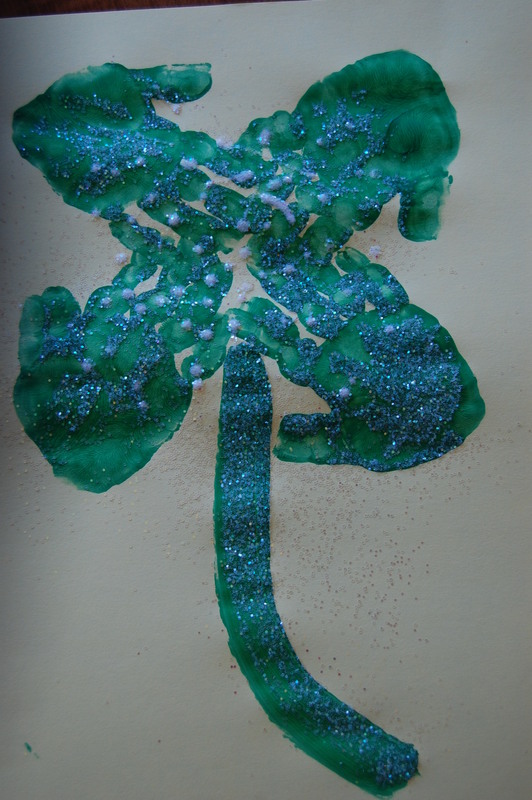 She was too impatient to wait for the clover to dry before we dotted it with glue and sprinkled glitter all over it. The glue will be less visible once it all dries. Also, if you sprinkle the glitter when the paint is still very wet, you don’t need the glue! Why am I shouting?